We've had way too much turkey and ham, so I thought it would be nice to have some real BEEF! As we are beef farmers there is a certain obligation to consume some of this delicious meat. As DH got far too many bottles of beer at Christmas, I blagged one off him, not difficult as he loves this beef cooked in beer almost more than drinking the beer! 1. Spray a large, shallow non-stick frying pan with a little cooking oil, heat until hot and brown the meat on allsides, then trnsfer it to a casserole dish. 2. Add the olive oil to the pan and saute the onions over a medium heat for about 10 minutes, or until they begin to soften. Add the garlic and sugar to the pan, stir well, reduce the heat to medium-low and cook for another 10 minutes or until the onions start to caramelise. 3. Stir in the flour and cook for 1 minute, then add the stout, stock cube and tomoato puree, stir well and bring to a simmer. 4. Transfer the onion mixture to the casserole dish and mix with the beef. Add the bay leaf and plenty of seasoning, cover and cook in a preheated oven, 170C/335F/Gas 3.5 for 2 hours. t5. Check the seasoning, remove the bay leaf and serve garnished with the parsley. Serving suggestion: Boiled potatoes, dark green cabbage and carrots are delicious with the beef. You will notice that I put carrots IN my stew, I also used only 1 tbsp olive oil and 1 tsp of brown sugar, still tasted delicious. 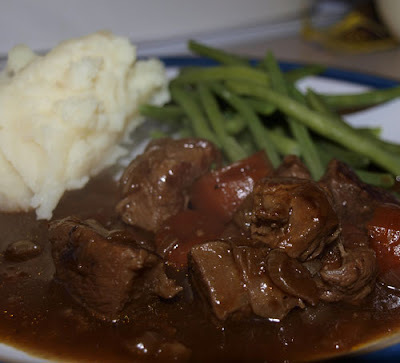 The gravy in this stew is just so rich and delicious, that I find mash is the best for soaking it up! Looks great Janice. Our healthy eating plan kicks in tomorrow when normaility returns to our world. Fantastic! I am attempting to stick to 400 calories per portion so that is just perfect! This beef looks very delicious. I'm not very good in cooking beef. Hope to try this one soon. Thanks for sharing. Janice, this looks and sounds delicious. Is your beef grass-fed? Judy, we don't 'finish' our cattle but sell them on to other farms. So it is not our own beef that I cook. Our calves are out to grass for 8-9 months of the year, but come inside for the cold and usually wet winter months. That is certainly an interesting Beef! Looks like a great combination of flavors.Hope to try this soon. Thanks for sharing. The Carbonnade of Beef looks rich and comforting, which is perfect for these very frozen times! That looks really good, but I doubt my husband will be volunteering any of his Bathams any time soon. That beef looks delicious, such a rich gravy over it. Very nicely done and photographed. This is my kind of dish... can't wait to try it!